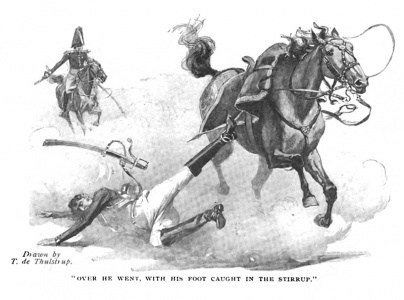 The Exploits of Brigadier Gerard: VI. 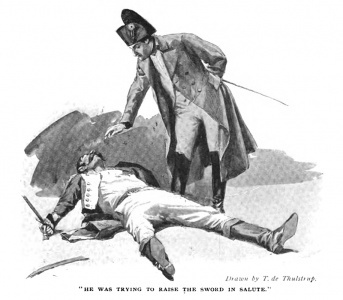 - How the Brigadier was Tempted by the Devil is a short story written by Arthur Conan Doyle first published in The Strand Magazine in september 1895. 7th story of the Gerard saga. "The conscripts made a fine-stand." 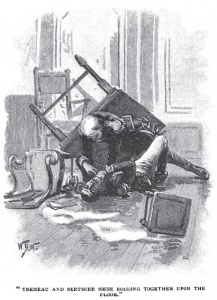 "Tremeau and Berthier were rolling together upon the floor." "We raised our hands in a salute." "'It is his!' She screamed." "Over he went, with his foot caught in the stirrup." 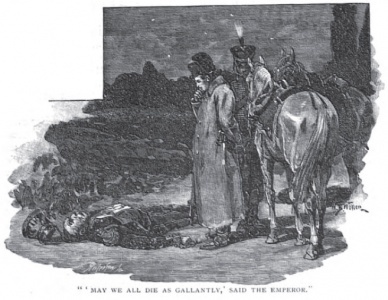 "'May we all die as gallantly,' said the Emperor." "He was mopping his forehead with his silk handkerchief." "'Sir!' I cried, 'I never thought to have seen the day—"
"Away we flew, striking fire from the cobblestones." "He was trying to raise the sword in salute." The spring is at hand, my friends. I can see the little green spear-heads breaking out once more upon the chestnut trees, and the café tables have all been moved into the sunshine. It is more pleasant to sit there, and yet I do not wish to tell my little stories to the whole town. You have heard my doings as a lieutenant, as a squadron officer, as a colonel, as the chief of a brigade. But now I suddenly become something higher and more important. I become history. If you have read of those closing years of the life of the Emperor which were spent in the Island of St Helena, you will remember that, again and again, he implored permission to send out one single letter which should be unopened by those who held him. Many times he made this request, and even went so far as to promise that he would provide for his own wants and cease to be an expense to the British Government if it were granted to him. But his guardians knew that he was a terrible man, this pale, fat gentleman in the straw hat, and they dared not grant him what he asked. Many have wondered who it was to whom he could have had anything so secret to say. Some have supposed that it was to his wife, and some that it was to his father-in-law; some that it was to the Emperor Alexander, and some to Marshal Soult. What will you think of me, my friends, when I tell you it was to me — to me, the Brigadier Gerard — that the Emperor wished to write? Yes, humble as you see me, with only my 100 francs a month of half-pay between me and hunger, it is none the less true that I was always in the Emperor's mind, and that he would have given his left hand for five minutes' talk with me. I will tell you tonight how this came about. It was after the Battle of Fére-Champenoise where the conscripts in their blouses and their sabots made such a fine stand, that we, the more long-headed of us, began to understand that it was all over with us. Our reserve ammunition had been taken in the battle, and we were left with silent guns and empty caissons. Our cavalry, too, was in a deplorable condition, and my own brigade had been destroyed in the charge at Craonne. 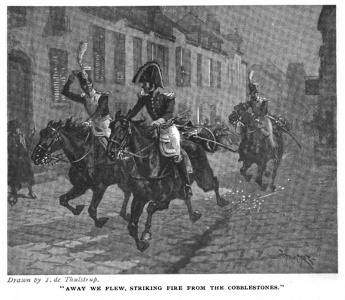 Then came the news that the enemy had taken Paris, that the citizens had mounted the white cockade; and finally, most terrible of all, that Marmont and his corps had gone over to the Bourbons. We looked at each other and asked how many more of our generals were going to turn against us. Already there were Jourdan, Marmont, Murat, Bernadotte, and Jomini — though nobody minded much about Jomini, for his pen was always sharper than his sword. We had been ready to fight Europe, but it looked now as though we were to fight Europe and half of France as well. We had come to Fontainebleau by a long, forced march, and there we were assembled, the poor remnants of us, the corps of Ney, the corps of my cousin Gerard, and the corps of Macdonald: twenty-five thousand in all, with seven thousand of the guard. But we had our prestige, which was worth fifty thousand, and our Emperor, who was worth fifty thousand more. He was always among us, serene, smiling, confident, taking his snuff and playing with his little riding-whip. Never in the days of his greatest victories have I admired him as much as I did during the Campaign of France. One evening I was with a few of my officers, drinking a glass of wine of Suresnes. I mention that it was wine of Suresnes just to show you that times were not very good with us. Suddenly I was disturbed by a message from Berthier that he wished to see me. When I speak of my old comrades-in-arms, I will, with your permission, leave out all the fine foreign titles which they had picked up during the wars. They are excellent for a Court, but you never heard them in the camp, for we could not afford to do away with our Ney, our Rapp, or our Soult — names which were as stirring to our ears as the blare of our trumpets blowing the reveille. It was Berthier, then, who sent to say that he wished to see me. He had a suite of rooms at the end of the gallery of Francis the First, not very far from those of the Emperor. In the ante-chamber were waiting two men whom I knew well: Colonel Despienne, of the 57th of the line, and Captain Tremeau, of the Voltigeurs. 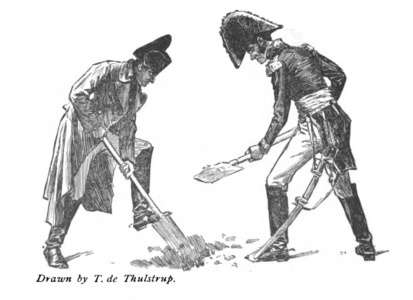 They were both old soldiers — Tremeau had carried a musket in Egypt — and they were also both famous in the army for their courage and their skill with weapons. Tremeau had become a little stiff in the wrist, but Despienne was capable at his best of making me exert myself. He was a tiny fellow, about three inches short of the proper height for a man — he was exactly three inches shorter than myself — but both with the sabre and with the small-sword he had several times almost held his own against me when we used to exhibit at Verron's Hall of Arms in the Palais Royal. You may think that it made us sniff something in the wind when we found three such men called together into one room. You cannot see the lettuce and dressing without suspecting a salad. To all of us the idea appeared not improbable. Certainly in the whole army we were the very three who might have been chosen to meet them. 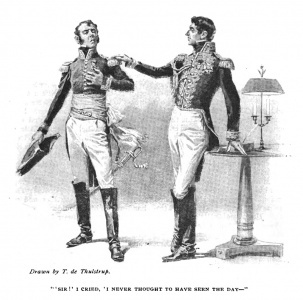 'The Prince of Neufchâtel desires to speak with the Brigadier Gerard,' said a footman, appearing at the door. In I went, leaving my two companions consumed with impatience behind me. It was a small room, but very gorgeously furnished. Berthier was seated opposite to me at a little table, with a pen in his hand and a note-book open before him. He was looking weary and slovenly — very different from that Berthier who used to give the fashion to the army, and who had so often set us poorer officers tearing our hair by trimming his pelisse with fur one campaign, and with grey astrakhan the next. On his clean-shaven, comely face there was an expression of trouble, and he looked at me as I entered his chamber in a way which had in it something furtive and displeasing. 'Chief of Brigade Gerard!' said he. 'At your service, your Highness!' I answered. My word, this was a fine beginning! I had no choice but to give the promise required. I assure you that when I heard this infamous proposition put forward by the man who had been the earliest friend of the Emperor, and who had received greater favours from him than any of his followers, I could only stand and stare at him in amazement. For his part he tapped his pen-handle against his teeth, and looked at me with a slanting head. I shook so with passion that my sabre clattered against my thigh. I was so moved by my own words and by the fine position which I had taken up, that my voice broke, and I could hardly refrain from tears. I should have liked the whole army to have seen me as I stood with my head so proudly erect and my hand upon my heart proclaiming my devotion to the Emperor in his adversity. It was one of the supreme moments of my life. The footman led me into an inner room, where he desired me to be seated. For my own part, my only desire was to get away, and I could not understand why they should wish to detain me. When one has had no change of uniform during a whole winter's campaign, one does not feel at home in a palace. I had been there about a quarter of an hour when the footman opened the door again, and in came Colonel Despienne. Good heavens, what a sight he was! His face was as white as a guardsman's gaiters, his eyes projecting, the veins swollen upon his forehead, and every hair of his moustache bristling like those of an angry cat. He was too angry to speak, and could only shake his hands at the ceiling and make a gurgling in his throat. 'Parricide! Viper!' those were the words that I could catch as he stamped up and down the room. Of course it was evident to me that he had been subjected to the same infamous proposals as I had, and that he had received them in the same spirit. His lips were sealed to me, as mine were to him, by the promise which we had taken, but I contented myself with muttering 'Atrocious! Unspeakable!' — so that he might know that I was in agreement with him. Well, we were still there, he striding furiously up and down, and I seated in the corner, when suddenly a most extraordinary uproar broke out in the room which we had just quitted. There was a snarling, worrying growl, like that of a fierce dog which has got his grip. Then came a crash and a voice calling for help. In we rushed, the two of us, and, my faith, we were none too soon. Old Tremeau and Berthier were rolling together upon the floor, with the table upon the top of them. The Captain had one of his great, skinny yellow hands upon the Marshal's throat, and already his face was lead-coloured, and his eyes were starting from their sockets. As to Tremeau, he was beside himself, with foam upon the corners of his lips, and such a frantic expression upon him that I am convinced, had we not loosened his iron grip, finger by finger, that it would never have relaxed while the Marshal lived. His nails were white with the power of his grasp. As to Berthier, he could only lean against the wall, and pant for a couple of minutes, putting his hands up to his throat and rolling his head about. Then, with an angry gesture, he turned to the heavy blue curtain which hung behind his chair. The curtain was torn to one side and the Emperor stepped out into the room. We sprang to the salute, we three old soldiers, but it was all like a scene in a dream to us, and our eyes were as far out as Berthier's had been. 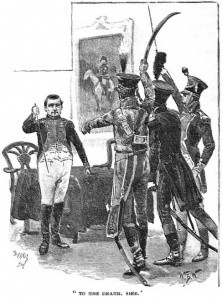 Napoleon was dressed in his green-coated chasseur uniform, and he held his little, silver-headed switch in his hand. He looked at us each in turn, with a smile upon his face — that frightful smile in which neither eyes nor brow joined — and each in turn had, I believe, a pringling on his skin, for that was the effect which the Emperor's gaze had upon most of us. Then he walked across to Berthier and put his hand upon his shoulder. 'You must not quarrel with blows, my dear Prince,' said he; 'they are your title to nobility.' He spoke in that soft, caressing manner which he could assume. There was no one who could make the French tongue sound so pretty as the Emperor, and no one who could make it more harsh and terrible. 'I believe he would have killed me,' cried Berthier, still rolling his head about. 'Tut, tut! I should have come to your help had these officers not heard your cries. But I trust that you are not really hurt!' He spoke with earnestness, for he was in truth very fond of Berthier — more so than of any man, unless it were of poor Duroc. Berthier laughed, though not with a very good grace. 'It is new for me to receive my injuries from French hands,' said he. You can fancy, my friends, the thrill of joy which it gave us when the greatest man in the whole world spoke to us in this fashion. Tremeau shook until I thought he would have fallen, and the tears ran down his gigantic moustache. If you had not seen it, you could never believe the influence which the Emperor had upon those coarse-grained, savage old veterans. It was new for us to be doing business, with a Marshal of France as sentry at the door. However, we followed the Emperor as we were ordered, and he led us into the recess of the window, gathering us around him and sinking his voice as he addressed us. 'To the death, sire!' cried Tremeau, and we both repeated it after him. Napoleon drew us all yet a little closer to him, and sank his voice still lower. My heart seemed to have changed to a nine-pounder ball as I listened to him. We had hoped against hope, but now when he, the man who was always serene and who always had reserves — when he, in that quiet, impassive voice of his, said that everything was over, we realized that the clouds had shut for ever, and the last gleam gone. Tremeau snarled and gripped at his sabre, Despienne ground his teeth, and for my own part I threw out my chest and clicked my heels to show the Emperor that there were some spirits which could rise to adversity. 'My papers and my fortune must be secured,' whispered the Emperor. 'The whole course of the future may depend upon my having them safe. They are our base for the next attempt — for I am very sure that these poor Bourbons would find that my footstool is too large to make a throne for them. Where am I to keep these precious things? My belongings will be searched — so will the houses of my supporters. They must be secured and concealed by men whom I can trust with that which is more precious to me than my life. Out of the whole of France, you are those whom I have chosen for this sacred trust. 'In the first place, I will tell you what these papers are. You shall not say that I have made you blind agents in the matter. They are the official proof of my divorce from Josephine, of my legal marriage to Marie Louise, and of the birth of my son and heir, the King of Rome. If we cannot prove each of these, the future claim of my family to the throne of France falls to the ground. Then there are securities to the value of forty millions of francs — an immense sum, my friends, but of no more value than this riding- switch when compared to the other papers of which I have spoken. I tell you these things that you may realize the enormous importance of the task which I am committing to your care. Listen, now, while I inform you where you are to get these papers, and what you are to do with them. 'They were handed over to my trusty friend, the Countess Walewski, at Paris, this morning. At five o'clock she starts for Fontainebleau in her blue berline. She should reach here between half-past nine and ten. The papers will be concealed in the berline, in a hiding-place which none know but herself. She has been warned that her carriage will be stopped outside the town by three mounted officers, and she will hand the packet over to your care. You are the younger man, Gerard, but you are of the senior grade. I confide to your care this amethyst ring, which you will show the lady as a token of your mission, and which you will leave with her as a receipt for her papers. These were the Emperor's directions, but given with an accuracy and minuteness of detail such as no one but himself could put into an order. When he had finished, he made us swear to keep his secret as long as he lived, and as long as the papers should remain buried. Again and again he made us swear it before he dismissed us from his presence. Colonel Despienne had quarters at the 'Sign of the Pheasant,' and it was there that we supped together. We were all three men who had been trained to take the strangest turns of fortune as part of our daily life and business, yet we were all flushed and moved by the extraordinary interview which we had had, and by the thought of the great adventure which lay before us. For my own part, it had been my fate three several times to take my orders from the lips of the Emperor himself, but neither the incident of the Ajaccio murderers nor the famous ride which I made to Paris appeared to offer such opportunities as this new and most intimate commission. We drank with him to our future cocked hats and our bâtons. It was agreed between us that we should make our way separately to our rendezvous, which was to be the first mile-stone upon the Paris road. In this way we should avoid the gossip which might get about if three men who were so well known were to be seen riding out together. My little Violette had cast a shoe that morning, and the farrier was at work upon her when I returned, so that my comrades were already there when I arrived at the trysting-place. I had taken with me not only my sabre, but also my new pair of English rifled pistols, with a mallet for knocking in the charges. They had cost me a hundred and fifty francs at Trouvel's, in the Rue de Rivoli, but they would carry far further and straighter than the others. It was with one of them that I had saved old Bouvet's life at Leipzig. The night was cloudless, and there was a brilliant moon behind us, so that we always had three black horsemen riding down the white road in front of us. The country is so thickly wooded, however, that we could not see very far. 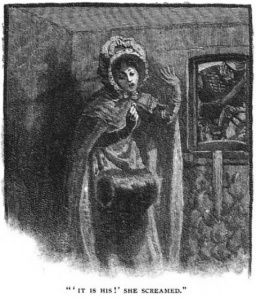 The great palace clock had already struck ten, but there was no sign of the Countess. We began to fear that something might have prevented her from starting. And then suddenly we heard her in the distance. Very faint at first were the birr of wheels and the tat-tat-tat of the horses' feet. Then they grew louder and clearer and louder yet, until a pair of yellow lanterns swung round the curve, and in their light we saw the two big brown horses tearing along the high, blue carriage at the back of them. The postilion pulled them up panting and foaming within a few yards of us. In a moment we were at the window and had raised our hands in a salute to the beautiful pale face which looked out at us. The Countess had a very beautiful, cream-tinted complexion of a sort which I particularly admire, but she grew whiter and whiter as she looked up at me. Harsh lines deepened upon her face until she seemed, even as I looked at her, to turn from youth into age. If she had struck me across the face with her delicate hand she could not have startled me more. It was not her words only, but the bitterness with which she hissed them out. I looked at Despienne, who had turned white with anger, and at Tremeau, who was tugging at his moustache. She held it up in the light of the carriage lamp, and the most dreadful expression of grief and of horror contorted her face. It was a thunder-clap. But those are the moments when I am at my finest. 'You remain here,' said I, to my comrades. 'If three horsemen pass you, stop them at any hazard. The lady will describe them to you. I will be with you presently.' One shake of the bridle, and I was flying into Fontainebleau as only Violette could have carried me. At the palace I flung myself off, rushed up the stairs, brushed aside the lackeys who would have stopped me, and pushed my way into the Emperor's own cabinet. He and Macdonald were busy with pencil and compasses over a chart. He looked up with an angry frown at my sudden entry, but his face changed colour when he saw that it was I. 'They are gone!' said I, and in a few curt words I told him what had happened. His face was calm, but I saw the compasses quiver in his hand. I did not wait to hear the end of the sentence. I was already clattering down the stairs. I am sure that five minutes had not passed before I was galloping Violette out of the town with the bridle of one of the Emperor's own Arab chargers in either hand. They wished me to take three, but I should have never dared to look my Violette in the face again. I feel that the spectacle must have been superb when I dashed up to my comrades and pulled the horses on to their haunches in the moonlight. They did not take long, those good soldiers. In a flash they were upon the Emperor's horses, and their own left masterless by the roadside. Then away we went upon our long chase, I in the centre, Despienne upon my right, and Tremeau a little behind, for he was the heavier man. Heavens, how we galloped! The twelve flying hoofs roared and roared along the hard, smooth road. Poplars and moon, black bars and silver streaks, for mile after mile our course lay along the same chequered track, with our shadows in front and our dust behind. We could hear the rasping of bolts and the creaking of shutters from the cottages as we thundered past them, but we were only three dark blurs upon the road by the time that the folk could look after us. It was just striking midnight as we raced into Corbail; but an hostler with a bucket in either hand was throwing his black shadow across the golden fan which was cast from the open door of the inn. 'On, on, my friends!' and away we flew, striking fire from the cobblestones of the little town. A gendarme tried to stop up, but his voice was drowned by our rattle and clatter. The houses slid past, and we were out on the country road again, with a clear twenty miles between ourselves and Paris. How could they escape us, with the finest horses in France behind them? Not one of the three had turned a hair, but Violette was always a head and shoulders to the front. She was going within herself too, and I knew by the spring of her that I had only to let her stretch herself, and the Emperor's horses would see the colour of her tail. 'There they are!' cried Despienne. 'We have them!' growled Tremeau. 'On, comrades, on!' I shouted, once more. A long stretch of white road lay before us in the moonlight. Far away down it we could see three cavaliers, lying low upon their horses' necks. Every instant they grew larger and clearer as we gained upon them. I could see quite plainly that the two upon either side were wrapped in mantles and rode upon chestnut horses, whilst the man between them was dressed in a chasseur uniform and mounted upon a grey. They were keeping abreast, but it was easy enough to see from the way in which he gathered his legs for each spring that the centre horse was far the fresher of the three. And the rider appeared to be the leader of the party, for we continually saw the glint of his face in the moonshine as he looked back to measure the distance between us. At first it was only a glimmer, then it was cut across with a moustache, and at last when we began to feel their dust in our throats I could give a name to my man. I had known him for years as a daring officer and an unprincipled rascal. Indeed, there was a score between us, for he had shot my friend, Treville, at Warsaw, pulling his trigger, as some said, a good second before the drop of the handkerchief. Well, the words were hardly out of my mouth when his two comrades wheeled round and fired their pistols at us. I heard Despienne give a terrible cry, and at the same instant both Tremeau and I let drive at the same man. 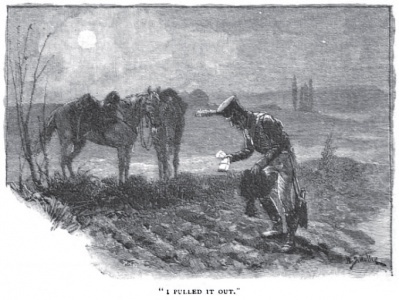 He fell forward with his hands swinging on each side of his horse's neck. His comrade spurred on to Tremeau, sabre in hand, and I heard the crash which comes when a strong cut is met by a stronger parry. For my own part I never turned my head, but I touched Violette with the spur for the first time and flew after the leader. That he should leave his comrades and fly was proof enough that I should leave mine and follow. He had gained a couple of hundred paces, but the good little mare set that right before we could have passed two milestones. It was in vain that he spurred and thrashed like a gunner driver on a soft road. His hat flew off with his exertions, and his bald head gleamed in the moonshine. But do what he might, he still heard the rattle of the hoofs growing louder and louder behind him. I could not have been twenty yards from him, and the shadow head was touching the shadow haunch, when he turned with a curse in his saddle and emptied both his pistols, one after the other, into Violette. I have been wounded myself so often that I have to stop and think before I can tell you the exact number of times. I have been hit by musket balls, by pistol bullets, and by bursting shells, besides being pierced by bayonet, lance, sabre, and finally by a brad-awl, which was the most painful of any. Yet out of all these injuries I have never known the same deadly sickness as came over me when I felt the poor, silent, patient creature, which I had come to love more than anything in the world except my mother and the Emperor, reel and stagger beneath me. I pulled my second pistol from my holster and fired point-blank between the fellow's broad shoulders. He slashed his horse across the flank with his whip, and for a moment I thought that I had missed him. 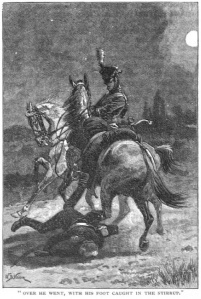 But then on the green of his chasseur jacket I saw an ever-widening black smudge, and he began to sway in his saddle, very slightly at first, but more and more with every bound, until at last over he went, with his foot caught in the stirrup, and his shoulders thud-thud-thudding along the road, until the drag was too much for the tired horse, and I closed my hand upon the foam-spattered bridle-chain. As I pulled him up it eased the stirrup leather, and the spurred heel clinked loudly as it fell. But even as I said, it, the huddle of the green body and the fantastic sprawl of the limbs in the moonlight told me clearly enough that it was all over with him. My bullet had passed through his heart, and it was only his own iron will which had held him so long in the saddle. He had lived hard, this Montluc, and I will do him justice to say that he died hard also. But it was the papers — always the papers — of which I thought. I opened his tunic and I felt in his shirt. Then I searched his holsters and his sabre-tasche. Finally I dragged off his boots, and undid his horse's girth so as to hunt under the saddle. There was not a nook or crevice which I did not ransack. It was useless. They were not upon him. When this stunning blow came upon me I could have sat down by the roadside and wept. Fate seemed to be fighting against me, and that is an enemy from whom even a gallant hussar might not be ashamed to flinch. I stood with my arm over the neck of my poor wounded Violette, and I tried to think it all out, that I might act in the wisest way. I was aware that the Emperor had no great respect for my wits, and I longed to show him that he had done me an injustice. Montluc had not the papers. And yet Montluc had sacrificed his companions in order to make his escape. I could make nothing of that. On the other hand, it was clear that, if he had not got them, one or other of his comrades had. One of them was certainly dead. The other I had left fighting with Tremeau, and if he escaped from the old swordsman he had still to pass me. Clearly, my work lay behind me. I hammered fresh charges into my pistols after I had turned this over in my head. Then I put them back in the holsters, and I examined my little mare, she jerking her head and cocking her ears the while, as if to tell me that an old soldier like herself did not make a fuss about a scratch or two. The first shot had merely grazed her off-shoulder, leaving a skin-mark, as if she had brushed a wall. The second was more serious. It had passed through the muscle of her neck, but already it had ceased to bleed. I reflected that if she weakened I could mount Montluc's grey, and meanwhile I led him along beside us, for he was a fine horse, worth fifteen hundred francs at the least, and it seemed to me that no one had a better right to him than I. Well, I was all impatience now to get back to the others, and I had just given Violette her head, when suddenly I saw something glimmering in a field by the roadside. It was the brass-work upon the chasseur hat which had flown from Montluc's head; and at the sight of it a thought made me jump in the saddle. How could the hat have flown off? With its weight, would it not have simply dropped? And here it lay, fifteen paces from the roadway! Of course, he must have thrown it off when he had made sure that I would overtake him. And if he threw it off — I did not stop to reason any more, but sprang from the mare with my heart beating the pas-de-charge. Yes, it was all right this time. There, in the crown of the hat was stuffed a roll of papers in a parchment wrapper bound round with yellow ribbon. I pulled it out with the one hand and, holding the hat in the other, I danced for joy in the moonlight. The Emperor would see that he had not made a mistake when he put his affairs into the charge of Etienne Gerard. I had a safe pocket on the inside of my tunic just over my heart, where I kept a few little things which were dear to me, and into this I thrust my precious roll. Then I sprang upon Violette, and was pushing forward to see what had become of Tremeau, when I saw a horseman riding across the field in the distance. At the same instant I heard the sound of hoofs approaching me, and there in the moonlight was the Emperor upon his white charger, dressed in his grey overcoat and his three-cornered hat, just as I had seen him so often upon the field of battle. I spurred forward and presented them without a word. He broke the ribbon and ran his eyes rapidly over them. Then, as we sat our horses head to tail, he threw his left arm across me with his hand upon my shoulder. Yes, my friends, simple as you see me, I have been embraced by my great master. I did not wish to contradict him, and it brought a flush of joy upon my cheeks to know that he had done me justice at last. 'Where is the thief, Gerard?' he asked. That was always the way with the Emperor. He would chat with you as with a friend and a brother, and then when he had wiled you into forgetting the gulf which lay between you, he would suddenly, with a word or with a look, remind you that it was as impassable as ever. When I have fondled my old hound until he has been encouraged to paw my knees, and I have then thrust him down again, it has made me think of the Emperor and his ways. He reined his horse round, and I followed him in silence and with a heavy heart. But when he spoke again his words were enough to drive all thought of myself out of my mind. When he said 'two' it turned me cold. 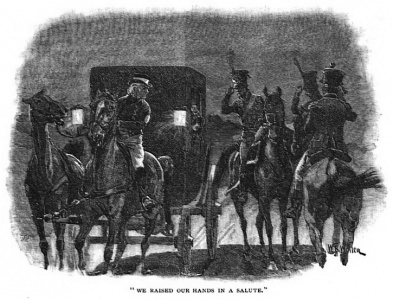 'Colonel Despienne was shot, sire,' I stammered. I remembered that I had seen a horseman a moment before I had met the Emperor. He had taken to the fields to avoid me, but if I had known, and Violette been unwounded, the old soldier would not have gone unavenged. I was thinking sadly of his sword-play, and wondering whether it was his stiffening wrist which had been fatal to him, when Napoleon spoke again. It must have been imagination, my friends, but for an instant I may confess that it seemed to me that there was a tone in the Emperor's voice which was not altogether one of sorrow. But the dark thought had hardly time to form itself in my mind before he let me see that I was doing him an injustice. As he spoke we came upon the scene of the struggle. Colonel Despienne and the man whom we had shot lay together some distance down the road, while their horses grazed contentedly beneath the poplars. 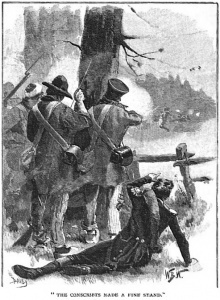 Captain Tremeau lay in front of us upon his back, with his arms and legs stretched out, and his sabre broken short off in his hand. His tunic was open, and a huge blood-clot hung like a dark handkerchief out of a slit in his white shirt. I could see the gleam of his clenched teeth from under his immense moustache. The Emperor sprang from his horse and bent down over the dead man. And the voice brought the man back from the dead. I saw his eyelids shiver. He twitched his arm, and moved the sword-hilt a few inches. He was trying to raise it in salute. Then the mouth opened, and the hilt tinkled down on to the ground. There was a farm within fifty yards of where we were standing, and the farmer, roused from his sleep by the clatter of hoofs and the cracking of pistols, had rushed out to the roadside. We saw him now, dumb with fear and astonishment, staring open-eyed at the Emperor. It was to him that we committed the care of the four dead men and of the horses also. For my own part, I thought it best to leave Violette with him and to take De Montluc's grey with me, for he could not refuse to give me back my own mare, whilst there might be difficulties about the other. Besides, my little friend's wound had to be considered, and we had a long return ride before us. The Emperor did not at first talk much upon the way. Perhaps the deaths of Despienne and Tremeau still weighed heavily upon his spirits. He was always a reserved man, and in those times, when every hour brought him the news of some success of his enemies or defection of his friends, one could not expect him to be a merry companion. Nevertheless, when I reflected that he was carrying in his bosom those papers which he valued so highly, and which only a few hours ago appeared to be for ever lost, and when I further thought that it was I, Etienne Gerard, who had placed them there, I felt that I had deserved some little consideration. The same idea may have occurred to him, for when we had at last left the Paris high road, and had entered the forest, he began of his own accord to tell me that which I should have most liked to have asked him. We were riding in the shadow of the trees at the time, and I could hear him slapping his riding-whip against his boot, and taking pinch after pinch of snuff, as was his way when he was excited. In truth, the objection had not occurred to me, but I did not wish to appear to have less wits than he gave me credit for, so I answered that it was indeed surprising. It is not for me to repeat to you, my friends, all that was said to me by the Emperor as we walked our horses amid the black shadows and through the moon-silvered glades of the great forest. Every word of it is impressed upon my memory, and before I pass away it is likely that I will place it all upon paper, so that others may read it in the days to come. He spoke freely of his past, and something also of his future; of the devotion of Macdonald, of the treason of Marmont, of the little King of Rome, concerning whom he talked with as much tenderness as any bourgeois father of a single child; and, finally, of his father-in-law, the Emperor of Austria, who would, he thought, stand between his enemies and himself. For myself, I dared not say a word, remembering how I had already brought a rebuke upon myself; but I rode by his side, hardly able to believe that this was indeed the great Emperor, the man whose glance sent a thrill through me, who was now pouring out his thoughts to me in short, eager sentences, the words rattling and racing like the hoofs of a galloping squadron. It is possible that, after the word-splittings and diplomacy of a Court, it was a relief to him to speak his mind to a plain soldier like myself. In this way the Emperor and I — even after years it sends a flush of pride into my cheeks to be able to put those words together — the Emperor and I walked our horses through the Forest of Fontainebleau, until we came at last to the Colombier. 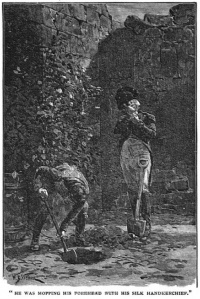 The three spades were propped against the wall upon the right-hand side of the ruined door, and at the sight of them the tears sprang to my eyes as I thought of the hands for which they were intended. The Emperor seized one and I another. We dug the hole, and placing the papers in one of my pistol holsters to screen them from the damp, we laid them at the bottom and covered them up. We then carefully removed all marks of the ground having been disturbed, and we placed a large stone upon the top. I dare say that since the Emperor was a young gunner, and helped to train his pieces against Toulon, he had not worked so hard with his hands. He was mopping his forehead with his silk handkerchief long before we had come to the end of our task. The first grey cold light of morning was stealing through the tree trunks when we came out together from the old pigeon-house. The Emperor laid his hand upon my shoulder as I stood ready to help him to mount. 'I forget it, sire,' said I. We rode together to the edge of the town, where he desired that I should separate from him. I had saluted, and was turning my horse, when he called me back. 'The papers, of course,' he cried, impatiently. He flushed with anger for a moment, and then he burst out laughing. So that was my strange adventure in which I found myself the friend and confident agent of the Emperor. When he returned from Elba he refrained from digging up the papers until his position should be secure, and they still remained in the corner of the old pigeon-house after his exile to St Helena. It was at this time that he was desirous of getting them into the hands of his own supporters, and for that purpose he wrote me, as I afterwards learned, three letters, all of which were intercepted by his guardians. Finally, he offered to support himself and his own establishment — which he might very easily have done out of the gigantic sum which belonged to him — if they would only pass one of his letters unopened. This request was refused, and so, up to his death in '21, the papers still remained where I have told you. How they came to be dug up by Count Bertrand and myself, and who eventually obtained them, is a story which I would tell you, were it not that the end has not yet come. Some day you will hear of those papers, and you will see how, after he has been so long in his grave, that great man can still set Europe shaking. When that day comes, you will think of Etienne Gerard, and you will tell your children that you have heard the story from the lips of the man who was the only one living of all who took part in that strange history — the man who was tempted by Marshal Berthier, who led that wild pursuit upon the Paris road, who was honoured by the embrace of the Emperor, and who rode with him by moonlight in the Forest of Fontainebleau. The buds are bursting and the birds are calling, my friends. You may find better things to do in the sunlight than listening to the stories of an old, broken soldier. And yet you may well treasure what I say, for the buds will have burst and the birds sung in many seasons before France will see such another ruler as he whose servants we were proud to be. This page was last edited on 12 February 2018, at 23:12.